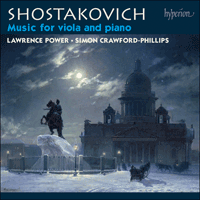 Lawrence Power makes the second of his appearances in this month’s release lists, this time with his regular pianist partner Simon Crawford-Phillips in the chamber music of Shostakovich. The centrepiece is the Viola Sonata, Shostakovich’s last completed work, premiered posthumously, on what would have been the composer’s sixty-ninth birthday. Its ravishing slow finale reworks the opening of Beethoven’s ‘Moonlight’ Sonata—a tribute to a composer he revered. Shostakovich the film composer also takes a bow, in the form of The Gadfly, with its famous ‘Romance’ beloved of violinists everywhere. That this works just as compellingly on the viola is triumphantly displayed in the arrangement made by Vadim Borisovsky (founding violist of the Beethoven Quartet), one of the Five Pieces he recast from Shostakovich’s original. Shostakovich’s 24 Piano Preludes have also proved irresistible to transcribers and here we have the seven brilliantly reworked by a pupil of Borisovsky, Yevgeny Strakhov. Though not a string player himself, Shostakovich enjoyed associations with some of the most stellar Soviet exponents, including David Oistrakh and Mstislav Rostropovich, for each of whom he composed two magnificent concertos. The violists in his life are rather less familiar, at least in the West. They include Vadim Vasilyevich Borisovsky (1900–1972), founding violist of the Beethoven Quartet, and his pupils Yevgeny Vladimirovich Strakhov (1909–1978), prominent pedagogue and orchestral soloist, and Fyodor Serafimovich Druzhinin (1932–2007), dedicatee and first performer of his last completed work, the Sonata for viola and piano. Strakhov studied with Borisovsky at the Moscow Conservatory in the 1930s, and taught at the same institution from 1936 until his death. He played in the Moscow Philharmonic Symphony Orchestra from his student days, and in the 1950s became soloist and section leader in the USSR State Symphony Orchestra. Among his hundred or so arrangements is one of Shostakovich’s Cello Sonata, as well as the seven piano preludes here recorded. The twenty-six-year-old Shostakovich composed his set of 24 Preludes between 30 December 1932 and 2 March 1933, roughly six years after his previous solo piano pieces, the Aphorisms, Op 13. Their directness and sharply defined characters are surely indebted to the huge amounts of music for stage and screen he had composed in the intervening years. At the same time, they showcase his newly evolving neoclassical style, already more than halfway towards the obligatory moderated language he adopted from the Fifth Symphony (1937) onwards. More practically, they served as vehicles for his own appearances as pianist. Since the first Chopin competition in 1927, where Shostakovich made a strong impression but was not among the top prize winners, he had given up thoughts of a solo performing career. But he continued to perform his own music, and from the late 1940s he also recorded much of it, including twelve of the Op 34 Preludes. Strakhov’s transcriptions may not be as well known as those by Dmitry Tsïganov for violin and piano, but they are no less resourceful. The pieces are transposed to suit the configuration of the viola, which is generally allocated the main thematic lines (though the fast waltz, No 15, effectively reverses the roles). The French titles are the transcriber’s—the originals give initial tempo indications only—though they take hints from Shostakovich’s notation when the character is less than obvious. The ‘Mélodie amoureuse’, for instance, picks up the ‘amoroso’ marking for the melody beginning in the third bar. The composer’s own recorded performance of this prelude goes a step further, suggesting tipsy strumming in a late-night bar—a mood deliciously enhanced in Lawrence Power’s interpretation. The Viola Sonata was Shostakovich’s last work, and there is good reason to suppose that he knew it would be. He composed the greater part of it in June and July 1975 and died, of lung cancer, on 9 August. Following his own wishes, the Sonata was first performed by its dedicatee Fyodor Druzhinin, violist of the Beethoven Quartet (in succession to Borisovsky), who played it in private on 25 September, which would have been the composer’s sixty-ninth birthday, and in public on 1 October to a packed audience in the Small Hall of the Leningrad Philharmonic. On that occasion Druzhinin acknowledged the standing ovation by holding the score aloft. In consultations with Druzhinin during the process of composition, Shostakovich described the first movement of the Sonata as a ‘novella’, perhaps in recognition of its free-flowing three-part form. Here, as in many of his late works, atmosphere and tension are generated by the friction between twelve-note themes (as at the piano’s first entry) and images of pure diatonicism (such as the bare perfect fifths of the viola’s opening statement, which metastasize into perfect-fourth two-note chords at the end of the movement). The scherzo-like second movement recycles the opening music from Shostakovich’s abandoned wartime opera on Gogol’s The Gamblers, a tale of card-sharps duped by their intended victim. In character this move­ment begins halfway between a polka and a quick march; the later stages are newly composed. Most thought-provoking of all is the Adagio finale, which takes as its starting point the bleak viola lines from the middle of the second movement. 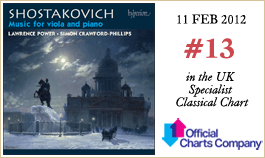 As the finale gets under way Shostakovich paraphrases the famous opening movement of Beethoven’s ‘Moonlight’ Sonata, drawing attention to the kinship between its repeated-note motif and his own favourite funereal intonations. At the heart of this movement is a passage of extreme austerity built on note-for-note quotations, mainly found in the piano left-hand part, from Shostakovich’s Second Violin Concerto and all fifteen of his symphonies in sequence. There could scarcely be a clearer indication that he knew—or at least suspected—that this would be his last work. On the last page the clouds clear, allowing yet another self-quotation to come through; this is the main theme of the early Suite for two pianos, Op 6, a work dedicated by its sixteen-year-old composer to the memory of his recently deceased father. The ‘radiance’ (the composer’s own description) of this transfigured C major, with its strong autobiographical associations, recalls the conclusion of Andrey Tarkovsky’s famous science-fiction film Solyaris (1972), where the main character is reunited with his dead father on the mysterious inter-planetary entity that has the power to realize the subconscious desires of those who contemplate it. From the time of his first public successes as a student until near the end of his life, Shostakovich wrote regularly for the cinema. It was an activity he occasionally complained about, but it provided a good income, especially when official disgrace stripped him of other means of financial support. The Gadfly (1955) was an adaptation of a novel by the English writer Ethel Voynich, concerning the activities of an Italian revolutionary, Arthur, in the 1830s and ’40s who acquires the nickname Gadfly by having become a thorn in the flesh of the authorities. The film’s director Alexander Faintsimmer is better known for Lieutenant Kijé, and Shostakovich’s score rivals Prokofiev’s in its melodic directness and memorability. Borisovsky’s five arrangements begin with the portentous music entitled ‘The Cliff’, composed in updated Russian national style. This is taken from the opening scene in the film, where the revolutionaries survey their homeland from a windswept cliff-top. The ‘Intermezzo’ conflates three movements associated with scenes in the cathedral. These originally featured the organ and were tinged with irony, since the Church is firmly on the side of repression and Arthur is tricked into betraying his comrades in the confessional. The piquant ‘Barrel-Organ Waltz’ originally accompanied Arthur walking through a town square some years later to a meeting with the Revolutionary party. The undoubted hit in the film is the ‘Romance’, originally entitled ‘Youth’ and depicting the young Arthur’s revolutionary fervour (rather than, as commonly assumed, his love for Gemma, the main heroine in the drama); its use as the theme-tune for the British TV spy drama Reilly, Ace of Spies helped to spread its fame to the West. Lev Atovmyan’s suite of twelve numbers from the total of twenty-four in the film, on which Borisovsky based his transcription, conflates this movement with ‘A Slap in the Face’, where Gemma discovers that Arthur has inadvertently betrayed the revolutionary movement. Equally attractive is the ‘Folk Festival’, again originally set in the town square. This adopts the folk-celebratory tone that was a more or less compulsory skill for Soviet composers, one Shostakovich had already mastered in the finale of his Symphony No 10 in 1953 and in his Festive Overture the following year. Bien qu’il ne jouât pas lui-même d’instrument à cordes, Chostakovitch prit plaisir à s’associer avec certains des plus brillants représentants de l’ère soviétique, comme David Oistrakh et Mstislav Rostropovitch, pour chacun desquels il composa deux magnifiques concertos. Les altistes qui marquèrent sa vie sont plus méconnus, du moins en Occident—ainsi Vadim Vasilievitch Borisovsky (1900–1972), altiste fondateur du Quatuor Beethoven, et ses élèves Ievgeni Vladimirovitch Strakhov (1909–1978), éminent pédagogue et soliste d’orchestre, et Fiodor Serafimovitch Druzhinin (1932– 2007), dédicataire et créateur de la dernière œuvre achevée de Chostakovitch, la Sonate pour alto et piano. De 1936 à sa mort, Strakhov enseigna au Conservatoire de Moscou, où il avait étudié avec Borisovsky dans les années 1930. Membre de l’Orchestre symphonique phil­harmonique de Moscou depuis ses années estudiantines, il devint, dans les années 1950, soliste et chef de pupitre de l’Orchestre symphonique national d’URSS. On lui doit une centaine d’arrangements, dont un de la Sonate pour violoncelle de Chostakovitch et un des sept préludes pour piano enregistrés ici. Chostakovitch avait vingt-six ans quand il composa ses Vingt-quatre préludes, du 30 décembre 1932 au 2 mars 1933, soit quelque six ans après ses précédentes pièces pour piano solo, les Aphorismes, op. 13. Leur côté direct et leur caractère finement défini doivent certainement beaucoup à l’énorme quantité de musique qu’il écrivit, pendant ces six années, pour la scène et le cinéma. Dans le même temps, ils témoignent de l’évolution récente de son style néoclassique, qui avait déjà accompli plus de la moitié du chemin vers le langage modéré qu’il dut adopter à partir de sa Symphonie no 5 (1937). D’un point de vue plus pratique, enfin, ils alimentèrent ses récitals de piano. Depuis 1927 et le premier concours Chopin, où il avait fait forte impression sans pour autant figurer parmi les grands lauréats, Chostakovitch avait abandonné toute idée de carrière soliste. Mais il continua d’interpréter ses œuvres et, à partir de la fin des années 1940, il en enregistra beaucoup, gravant notamment douze de ses Préludes op. 34. Les transcriptions de Strakhov ne sont peut-être pas aussi connues que celles de Dmitri Tsïganov pour violon et piano, mais elles sont tout aussi inventives. Les pièces sont transposées pour s’adapter à la configuration de l’alto, qui se voit généralement confier les grandes lignes thématiques (encore que la valse vite, no 15, inverse efficacement les rôles). Bien qu’émanant du transcripteur—les originaux se contentaient de donner les indications de tempo initiales—, les titres français s’inspirent de la notation de Chostakovitch, dès lors que le caractère du morceau est tout sauf évident. La «Mélodie amoureuse» glane ainsi l’indication «amoroso» pour la mélodie commençant à la troisième mesure. Dans l’enregistrement qu’il a réalisé de ce prélude, le compositeur va même plus loin et suggère quelqu’un d’éméché, tapotant dans un bar de nuit—une ambiance délicieuse­ment exacerbée dans l’interprétation de Lawrence Power. Avec sa Sonate pour alto, Chostakovitch signa sa dernière œuvre, et tout porte à croire qu’il le savait—il la composa en grande partie en juin–juillet 1975 et mourut le 9 août, d’un cancer du poumon. Conformément à ses souhaits, elle fut créée par son dédicataire Fiodor Druzhinin, altiste du Quatuor Beethoven (il succéda à Borisovsky), qui en donna une exécution privée le 25 septembre—Chostakovitch eût alors fêté ses soixante-neuf ans—et publique le 1er octobre, devant un parterre massé dans le Petit Hall de la Philharmonie de Léningrad. Ce jour-là, Druzhinin accueillit l’ovation du public, debout, en brandissant bien haut la partition. Lorsqu’il consulta Druzhinin, pendant la composition, Chostakovitch qualifia le premier mouvement de «novella», peut-être parce qu’il lui reconnaissait une forme tripartite libre. Ici, comme dans nombre de ses œuvres tardives, atmosphère et tension viennent de la friction entre des thèmes dodécaphoniques (comme à la première entrée du piano) et des images de pur diatonisme (ainsi les quintes justes, dépouillées, de l’exposition inaugurale de l’alto qui métastasent, à la fin du mouvement, en accords de deux notes en quartes justes). Le deuxième mouvement qui tient lieu de scherzo recycle la musique ouvrant l’opéra, inachevé, que Chostakovitch entreprit de composer, en pleine guerre, d’après Les Joueurs de Gogol, une histoire de tricheurs professionnels dupés par celui-là même dont ils voulaient faire leur victime. S’agissant de son caractère, ce mouvement commence à mi-chemin entre la polka et la marche rapide; les volets ultérieurs sont de composition nouvelle. De tous les mouvements, le plus stimulant est le finale Adagio qui part des austères lignes d’alto du milieu du deuxième mouvement. Alors que ce finale démarre, Chostakovitch paraphrase le fameux mouvement inaugurant la Sonate «Clair de lune» de Beethoven et attire donc l’attention sur la parenté entre le motif beethovénien en notes répétées et ses propres intonations funèbres favorites. Au cœur de ce mouvement se trouve un passage d’une austérité extrême, bâti sur des citations note pour note, et essentiellement à la main gauche du pianiste, de son Concerto pour violon no 2 et de ses quinze symphonies, à la file—signe qu’il savait, ou du moins soupçonnait, que cette œuvre serait sa dernière. À la page finale, les nuages se dissipent, laissant percer une nouvelle autocitation: le thème principal de la Suite pour deux pianos op. 6, une œuvre précoce que Chostakovitch dédia, à seize ans, à la mémoire de son père, récemment disparu. L’«éclat» (le mot est du compositeur) de cet ut majeur transfiguré, aux fortes connotations auto­biographiques, rappelle la fin de Solaris (1972), le célèbre film de science-fiction d’Andreï Tarkovsky, où le person­nage principal et son défunt père sont réunis sur la mystérieuse entité interplanétaire douée du pouvoir de réaliser les désirs subconscients de qui la contemple. De ses premiers succès d’étudiant jusqu’à la fin de sa vie, ou presque, Chostakovitch écrivit régulièrement pour le cinéma. Il s’en plaignit parfois, mais cela lui valut de bons subsides, surtout quand la disgrâce officielle lui ôta toute autre source de revenu. Le Taon (1955) est l’adaptation d’un roman de l’Anglaise Ethel Voynich sur les activités d’Arthur, un révolutionnaire italien des années 1830–40 surnommé le taon car devenu la bête noire des autorités. Le réalisateur de ce film est Alexander Faintsimmer, plus connu pour son Lieutenant Kijé mais, par son caractère mélodique franc comme par son côté inoubliable, la partition de Chostakovitch rivalise avec celle de Prokofiev. Les cinq arrangements de Borisovsky s’ouvrent sur «La Falaise», une musique solennelle écrite dans un style nationaliste russe suranné et empruntée à la scène inaugurale du film, où les révolutionnaires surveillent leur patrie du haut d’une falaise balayée par les vents. L’«Intermezzo» collige trois mouvements associés à des scènes dans la cathédrale; originellement, ils faisaient intervenir un orgue et étaient teintés d’ironie car, dans le film, l’Église est résolument du côté de la répression et c’est dans le confessional qu’Arthur est amené, par la ruse, à trahir ses camarades. La piquante «Valse à l’orgue de Barbarie» accompagnait Arthur traversant une place, quelques années plus tard, pour se rendre à une réunion du parti révolutionnaire. Le succès absolu du film est la «Romance» (primitivement intitulée «Jeunesse»), qui dépeint la ferveur révolutionnaire du jeune Arthur (et non, comme on le croit souvent, son amour pour Gemma, l’héroïne); avoir servi de générique au téléfilm d’espionnage Reilly, Ace of Spies, diffusé sur le réseau britannique, contribua à asseoir sa réputation à l’Ouest. La suite de douze numéros de Lev Atovmyan (réalisée à partir des vingt-quatre que compte le film), sur laquelle Borisovsky fonda sa transcription, accole ce mouvement à «Une gifle au visage», quand Gemma découvre qu’Arthur a, par inadvertance, trahi le mouvement révolutionnaire. Tout aussi attrayante, la «Fête populaire», qui se tient sur la place, adopte ce ton de liesse populaire que tous les compositeurs soviétiques se devaient plus ou moins de maîtriser, comme Chostakovitch l’avait déjà fait dans le finale de sa Symphonie no 10, en 1953, et dans son Ouverture festive, l’année suivante. Obwohl er selbst kein Streicher war, stand Schostakowitsch mit mehreren hervorragenden sowjetischen Streichern, darunter David Oistrach und Mstislaw Rostropowitsch, in Kontakt, für die er jeweils zwei großartige Solokonzerte komponierte. Die Bratscher, die ihm nahestanden, sind, zumindest im Westen, weniger bekannt. Dazu gehören Wadim Wassiljewitsch Borisowski (1900–1972), der Gründer-Bratscher des Beethoven-Streichquartetts, sowie dessen Schüler Jewgeni Wladimirowitsch Strachow (1909–1978), ein prominenter Pädagoge und Orchestermusiker, und Fjodor Serafimowitsch Druschinin (1932– 2007), der Widmungsträger und erste Ausführende seines letzten vollendeten Werks, der Sonate für Viola und Klavier. Strachow studierte in den 1930er Jahren bei Borisowski am Moskauer Konservatorium und unterrichtete ab 1936 bis zu seinem Tod selbst an der Einrichtung. Während seines Studiums begann er, im Philharmonischen Sinfonieorchester Moskau mitzuspielen und in den 1950er Jahren wurde ihm die Position als Solobratscher im Staatlichen Sinfonieorchester der UdSSR übertragen. Er fertigte etwa hundert Arrangements für sein Instrument an und bearbeitete unter anderem die Cellosonate von Schostakowitsch, wie auch die sieben hier vorliegenden Klavierpräludien. Schostakowitsch komponierte im Alter von 26 Jahren seinen Zyklus von 24 Präludien zwischen dem 30. Dezember 1932 und dem 2. März 1933—rund sechs Jahre, nachdem seine vorherigen Stücke für Soloklavier, die Aphorismen op. 13, entstanden waren. Ihre Direktheit und scharf konturierten Charakterisierungen verdanken diese Stücke sicherlich den vielen Werken für Bühne und Film, die er in den dazwischenliegenden Jahren komponiert hatte. Gleichzeitig zeigt sich hier sein neuer, sich gerade entwickelnder neoklassischer Stil, der bereits weitgehend an den obligatorischen gemäßigten Klangausdruck angelehnt ist, den er ab seiner Fünften Symphonie (1937) verwendete. In praktischer Hinsicht dienten sie als Gebrauchsstücke für seine Auftritte als Pianist. Seit dem ersten Chopin-Wettbewerb im Jahre 1927, bei dem Schostakowitsch zwar einen starken Eindruck hinterließ, aber nicht zu den wichtigsten Preisträgern gehörte, hatte er alle Pläne einer Solokarriere aufgegeben. Allerdings bot er weiterhin seine eigenen Werke dar und ab den 1940er Jahren spielte er zudem viele seiner Kompositionen ein, darunter auch zwölf Präludien aus Opus 34. Strachows Transkriptionen mögen zwar weniger bekannt sein als diejenigen von Dmitri Zyganow für Violine und Klavier, doch sind sie ebenso einfallsreich. Die Stücke sind derart transponiert, dass sie sich für die Lage der Bratsche eignen, die zumeist die wichtigsten thematischen Linien übernimmt (obwohl in dem schnellen Walzer, Nr. 15, die Rollen sozusagen umgekehrt sind). Die französischen Titel stammen von dem Arrangeur—das Original ist nur mit Tempobezeichnungen versehen, doch folgen sie den Hinweisen Schostakowitschs, wenn der Charakter des Stücks nicht gleich erkennbar ist. In der „Mélodie amoureuse“ ist beispielsweise die die Anweisung „amoroso“ enthalten, die über der Melodie zu Beginn des dritten Takts angegeben ist. In seiner eigenen Einspielung dieses Präludiums geht der Komponist sogar noch einen Schritt weiter und deutet etwas angesäuseltes Geklimper in einer spätabendlichen Bar an—eine Stimmung, die in der Interpretation von Lawrence Power in köstlicher Weise verstärkt wird. Die Bratschensonate war das letzte Werk, das Schostakowitsch fertigstellte und man darf wohl davon ausgehen, dass er sich dessen auch bewusst war. Er komponierte es zum größten Teil im Juni und Juli 1975 und starb am 9. August an Lungenkrebs. Seinen Wünschen zufolge wurde die Sonate erstmals von ihrem Widmungsträger Fjodor Druschinin, dem Bratschisten des Beethoven-Streichquartetts (nach Borisowski) aufgeführt, der sie am 25. September (an dem der Komponist 69 geworden wäre) im privaten Kreise und am 1. Oktober in dem brechend vollen Kleinen Saal der Leningrader Philharmonie spielte. Zu dieser Gelegenheit reagierte Druschinin auf die stehenden Ovationen, indem er die Partitur hochhielt. Als er sich während des Komponierens mit Druschinin beriet, beschrieb Schostakowitsch den ersten Satz der Sonate als eine „Novelle“—vielleicht in Anlehnung an die fließende dreiteilige Form des Stücks. Wie in so vielen seiner Spätwerke werden auch hier die Atmosphäre und Spannung durch die Reibung zwischen den zwölftönigen Themen (wie etwa bei dem ersten Klaviereinsatz) und Darstellungen von purer Diatonik (wie etwa die leeren reinen Quinten der Anfangsfigur der Viola, die sich dann am Ende des Satzes in Zweitonakkorde—bestehend aus reinen Quarten—verwandeln) erzeugt. Im zweiten, scherzoartigen Satz wird Material wiederverwendet, das aus Schostakowitschs verworfener Kriegsoper über Gogols Komödie Die Spieler, einer Geschichte über Falschspieler, die von ihrem vermeintlichen Opfer überlistet werden, stammte. Dem Charakter dieses Stoffes entsprechend beginnt der Satz in einer Mischung von Polka und schnellem Marsch; die darauf folgenden Abschnitte sind neukomponiert. Das Finale, Adagio, regt am meisten zum Nachdenken an. Es beginnt mit den trostlosen Bratschen-Phrasen aus dem Mittelteil des zweiten Satzes und etwas später paraphrasiert Schostakowitsch den berühmten ersten Satz der „Mondscheinsonate“ von Beethoven, wobei er auf die Verwandtschaft des Tonrepetitionsmotivs mit seinen eigenen desolaten Melodien hinweist. Im Zentrum dieses Satzes erklingt eine besonders herbe Passage, der Ton-für-Ton-Zitate (hauptsächlich in der linken Hand des Klaviers) zugrunde liegen, die aus Schostakowitschs Zweitem Violinkonzert und allen seiner insgesamt 15 Symphonien (in chronologischer Reihenfolge) stammen. Die Hinweise darauf, dass er wusste—oder zumindest annahm—dass dies sein letztes Werk sein sollte, könnten deutlicher nicht sein. Auf der letzten Seite lichten sich die Wolken und erlauben ein weiteres Eigenzitat; diesmal stammt es aus der frühen Suite für zwei Klaviere op. 6; ein Werk, das der 16-jährige Komponist dem Andenken seines damals gerade verstorbenen Vaters gewidmet hatte. Der „Glanz“ (so der Komponist selbst) dieses verklärten C-Dur mit seinen starken autobiographischen Zügen erinnert an den Schluss des berühmten Science-fiction-Films Solaris (1972) von Andrei Tarkowski, in dem der Protagonist auf einem mysteriösen interplanetaren Konstrukt, das die Fähigkeit besitzt, unterbewusste Wünsche zu realisieren, mit seinem verstorbenen Vater zusammenkommt. Von der Zeit, als er als Student seine ersten öffentlichen Erfolge feierte, bis kurz vor Ende seines Lebens schrieb Schostakowitsch regelmäßig Musik für das Kino. Es war dies eine Tätigkeit, über die er sich zuweilen beklagte, die jedoch für ein gutes Einkommen sorgte, besonders als er offiziell in Ungnade gefallen war und damit seine anderen Einnahmequellen versiegt waren. The Gadfly [Die Stechfliege] von 1955 war eine Bearbeitung des gleichnamigen Romans der englischen Schriftstellerin Ethel Voynich über das Wirken eines italienischen Revolutionärs, Arthur, in den 30er und 40er Jahren des 19. Jahrhunderts, der den Spitznamen „Gadfly“ erhält, da er der Obrigkeit zu einem Dorn im Auge wird. Der Regisseur des Films, Aleksandr Fajntsimmer, war für seinen Film Leutnant Kishe, dessen Musik Prokofiev besorgte, noch bekannter. Die Partitur Schostakowitschs kann es jedoch, was die Direktheit und Einprägsamkeit der Melodien anbelangt, durchaus mit derjenigen von Prokofiev aufnehmen. Borisowskis fünf Arrangements beginnen mit der unheilvollen Musik „Die Klippe“, die im modernen russischen Stil gehalten ist. Sie stammt aus der Eingangsszene des Films, in der die Revolutionäre ihre Heimat von einer windumtosten Klippe aus überblicken. Im „Intermezzo“ verschmelzen drei Sätze miteinander, die mit Szenen in der Kathedrale verbunden sind. Diese zeichneten sich ursprünglich durch Orgelmusik und Ironie aus, da die Kirche entschieden auf der Unterdrückerseite steht und Arthur bei der Beichte derart überlistet wird, dass er seine Genossen verrät. Der pikante „Drehleier-Walzer“ (Sharmanka) begleitete Arthur ursprünglich, als er auf dem Weg zu einer Versammlung der Revolutionären Partei einen Stadtplatz überquert. Die „Romance“ ist jedoch zweifellos der Hit des Films. Sie war ursprünglich mit „Jugend“ überschrieben und stellt den revolutionären Eifer des jungen Arthur (und nicht, wie weithin angenommen, seine Liebe zu Gemma, der Heldin des Dramas) dar; als Titelmelodie des britischen Fernseh-Agentendramas Reilly, Ace of Spies wurde sie auch im Westen bekannt. In der Suite von Lew Atowmian (mit 12 der insgesamt 24 Nummern aus dem Film), die Boriskowskis Transkription zugrunde liegt, ist dieser Satz mit dem Satz „Eine Ohrfeige“ vereinigt, in dem Gemma herausfindet, dass Arthur die Revolutionsbewegung versehentlich verraten hat. Ebenso reizvoll ist das „Volksfest“ (Folk Festival), das wiederum ursprünglich auf dem Stadtplatz stattfindet. Dieses ist in einem feierlichen Volkston gehalten, der für sowjetische Komponisten eine mehr oder minder verbindliche Fertigkeit war und die Schostakowitsch bereits in dem Finale seiner 10. Symphonie von 1953 sowie in seiner Festlichen Ouvertüre aus dem folgenden Jahr gemeistert hatte.